From the integration of passive design measures and energy efficiency, use of alternative water sources, selection of construction materials for healthy indoor environment, consideration of lower embodied energy materials, and finally, to the restoration of ecological habitat, sustainable tropical building design mitigates the environmental impacts and carbon footprint by designing and constructing buildings that are climate-appropriate, healthy and comfortable for building occupants. 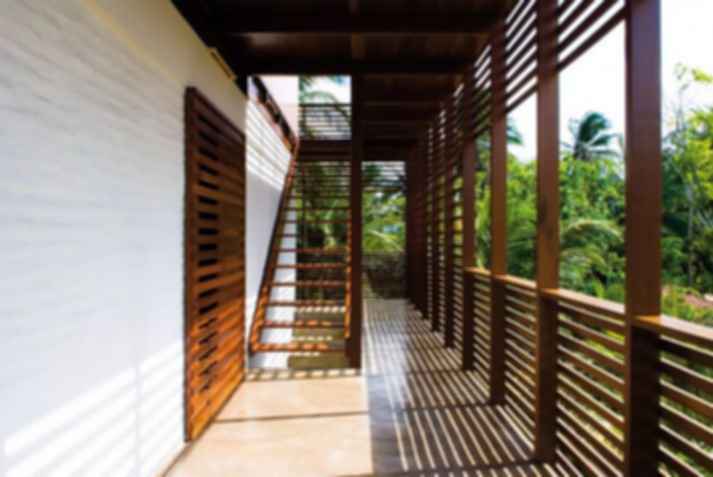 Applying passive design principles for tropical buildings include the orientation of the building towards easterly winds for natural ventilation and reducing exposure to midday sun for avoidance of heat gain. Also, openings such as windows, doors and vents should be aligned to facilitate easy air flow. Use of materials with low thermal mass is advisable, and if not applicable, materials with high thermal mass should be shaded. Windows could make use of tints, reflective coatings or advanced glazing technologies. High ceilings and the use of roof ventilation systems such as spinning vents and ridge vents are encouraged for the natural stack effect or convection wherein hot air rises and cold air sinks. Insulation types for roof, ceiling or walls would include bulk insulation (prevention of cool air loss) and reflective insulation (heat release). Use of porous materials such as gravel and permeable paving are integrated rather than the non-porous concrete to lessen the urban heat island effect. Skylights, atria, light shelves, clerestory windows and light tubes incorporated into the design allow for natural lighting rather than the use of mechanical means, hence the energy efficiency of the building. Installation of recycled water supply from greywater (waste water from showers and basins) proves to be a cost-effective method for reducing water consumption. Also, rainwater collected from gutter can make use of flush diversion devices for contaminants like dust and bird droppings. To manage storm water, preservation of original topography is cultivated. Green roofs ranging in 15 cm in soil depth provide insulation and mitigation of water runoff. Infiltration trenches, swales, bio-retention system and rain gardens are strategic green solutions that replace in-ground storm water pipes by mimicking natural processes such as improvement of rainwater absorption into the soil. Operable windows provide adequate fresh air intake and the placement of breathing walls and indoor plants add to the healthy air quality of the building. Also, materials with less volatile organic compounds are selected to attain low toxicity indoor environment. High VOCs from paints, finishes, polyvinyl chloride are to be avoided as they provide emissions harmful to health, leading to sick building syndrome. The extraction and processing of raw materials result in the embodied energy of a material. Naturally, low embodied energy levels are desired for construction such as the recycled materials. Substitute for the cement agents such as fly ash contribute to the reduction of environmental impact. Also for local environment, peculiar trees are selected to provide shade and breeze filtering rather than blocking. To reduce the ecological impact, the location of the building is placed at the least sensitive part of the area, merging organically with the nature and trees. What are other sustainable green strategies that can be applied for tropical buildings? Leave your comments below! Allow only live-work car-free developments (equipped with broadband) to remove traffic congestion loads on urban infrastructure and undermine the car fetishism associated with middle class aspiration. Use only materials available locally that are not required to be transported by diesel truck, or made remotely in factories. That promotes local trades, skills, employment and economies.